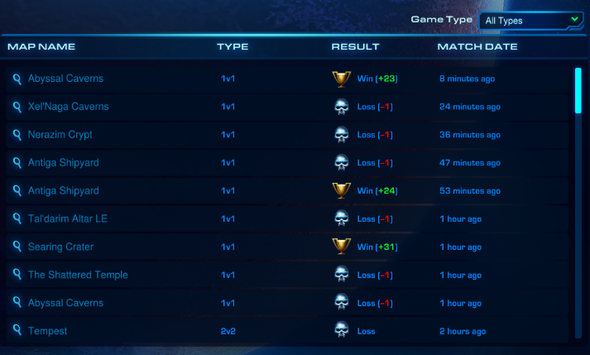 i wonder if blizzard changed how the MMR system works? Since the past(beta phase 1) i have been thinking about the 'favored' indication as a result of MMR. But after season 3 came out, seeing situations like this make me change my opinion. As you can see, this was take out of one of my friends profile and he is not the only one who has profile like this. He is a high master player who has beaten + got matched with several GM before (he has beaten dayvie for example). The people he is getting matched with are not gm at all, those are 1k5 1k6 master last season aka. mid master players. Beginning of season your points are way lower than your MMR so both players will be favored and such. Eventually as your points start to level out you'll see it begin to even out. this is standard. Exactly this, it's accelerating the good players to get where they belong. Edit: To your point about who he was being matched up with, if he's losing the majority of the game then they are obviously better so maybe they just hadn't played enough games to catch up to their own MMR yet. if his MMR is higher then your points hes favored, resulting in more wins if you win, and less points lost when you lose. Who are you and how do you know my name/id/Match history? High points do not necessarily translate to high MMR. i think i didnt make it clear enough: A GM level player lost game to a mid master and only lose 1 point. What i was trying to say is that blizzard started using the favored system to rewards point for high MMR players instead of using the MMR to calculate the favored system. This is the way its always been, at the start of the season it works weird. In short, the MMR system tries to match you vs. someone with a similar MMR. The "Favored" system then compares *your* current points to *your opponent's* MMR to determine how many points you will get for a win. This is why at the beginning of a season, you get so many points for a win and lose 1-4 for a loss. Your points haven't caught up to your MMR yet, so you're getting a ton of points for fighting people with an MMR much higher than your point total, but still equal to your MMR. Hard to wrap your head around at first, but the chart in that thread is very helpful for it.